On behalf of admin of JML Law, A Professional Law Corporation posted in Police Misconduct on Thursday, Feb 01 2018. In the latest outrageous case of police misconduct, an LAPD officer was not charged after using his handgun against teenagers. Thousands of people in Los Angeles have been protesting against an off-duty Los Angeles police officer who fired his gun during a brawl with a group of teenagers last year. It’s been nearly a year since the scandalous incident, and Kevin Ferguson, the cop in question, has not been charged despite a long-running legal battle brewing in LA. The news has come to our Los Angeles Police Misconduct Attorney attention. The Orange County District Attorney’s Office announced this past week that the off-duty Los Angeles Police Department cop acted lawfully as a private citizen when he used his handgun against the teenagers in February 2017. Despite many lawyers saying that Ferguson would face criminal charges and would be held liable for the alleged case of police misconduct, the police officer – like many other officers in Los Angeles abusing their power and using excessive force when detaining civilians – has gotten away. Fact: every 7 hours, a police officer kills one American. Even though the district attorney’s office found no evidence proving that Ferguson committed a crime when firing his weapon into the ground, it still determined that the LAPD cop was “not smart or sensible” during the altercation with teenagers. In fact, the district attorney concluded that Ferguson put the lives of the teenagers in danger when using his gun nearly a year ago. During the altercation, which took place outside his Anaheim home last year, Ferguson confronted a large group of 14 teens and things got physical. As seen from many videos filmed during the brawl, Ferguson used physical force and insulted the teenagers. Then, at one point of the altercation, the off-duty LAPD cop pulled out his gun – allegedly reacting to a perceived threat when one of the teenagers reached into his pocket to pull out a pencil or pen – and fired the weapon into the ground. Nobody was injured as a result of the shooting. The court evaluated the case treating Ferguson as a private citizen, not a police officer, since the LAPD cop was not on duty during the incident. The LAPD officer walking away with no charges in an obvious case of police brutality, using excessive force and police misconduct, is not that shocking. 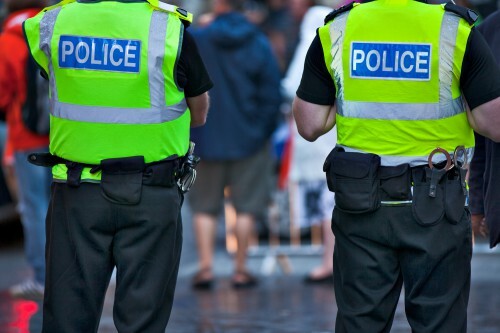 Our Los Angeles police misconduct attorney at JML Law notes that thousands of police officers engage in some form of police misconduct every year. Taking legal action against cops, meanwhile, presents a plethora of challenges and bureaucratic hoops that a U.S. citizen needs to jump through in order to hold a police officer liable. The importance of being represented by the best police misconduct attorneys in Los Angeles is often underestimated, which is why a shocking number of cops walk away with no charges and don’t face any punishment and penalties for their wrongful actions against unarmed and innocent civilians. Here at JML Law, our Los Angeles police misconduct attorneys say: don’t let police officers get away with police brutality, sexual assault, using excessive force, false arrests, unlawful searches and seizures, wrongful shootings, and other types of police misconduct. Don’t be afraid to speak up and take legal action. With a Los Angeles police misconduct attorney by your side, you don’t have to worry about retaliation or being intimidated by police officers or their chiefs, because we respect your right to confidentiality. If you or any of your loved have been victimized in a police misconduct incident, don’t hesitate to contact a skilled attorney to review your case. Let us determine the strengths and weaknesses of your case, and come up with a personalized strategy for you to hold the police officer or law enforcement official responsible for his or her actions. If they abuse their power, you fight back and make THEM pay for it. Call our Los Angeles offices at 818-610-8800 today or send an email to get a free consultation.